Preprints (earlier versions) of this paper are available at http://preprints.jmir.org/preprint/364, first published Jan 24, 2005. Background: Online cancer-related support is an under-studied resource that may serve an important function in the information seeking, care, and support of cancer patients and their families. With over 9.8 million cancer survivors (defined as anyone living with cancer) in the United States alone and the number growing worldwide, it is important to understand how they seek and use online resources to obtain the information they need, when they need it, and in a form and manner appropriate to them. These are stated cancer communication goals of the US National Cancer Institute. Objectives: Our purposes are to (1) present background information about online mailing lists and electronic support groups, (2) describe the rationale and methodology for the Health eCommunities (HeC) study, and (3) present preliminary baseline data on new subscribers to cancer-related mailing lists. In particular, we describe subscribers' use of mailing lists, their reasons for using them, and their reactions to participating shortly after joining the lists. Methods: From April to August 2004, we invited all new subscribers to 10 Association of Cancer Online Resources mailing lists to complete Web-based surveys. We analyzed baseline data from the respondents to examine their perceptions about cancer-related mailing lists and to describe how cancer patients and survivors used these lists in the period shortly after joining them. Results: Cumulative email invitations were sent to 1368 new mailing list subscribers; 293 Web surveys were completed within the allotted time frame (21.4% response rate). Most respondents were over age 50 (n = 203, 72%), white (n = 286, 98%), college graduates (n = 161, 55%), and had health insurance (n = 283, 97%). About 41% (n = 116) of new subscribers reported spending 1 to 3 hours per day reading and responding to list messages. They used the mailing lists for several reasons. Among the most frequently reported, 62% (n = 179) strongly agreed they used mailing lists to obtain information on how to deal with cancer, 42% (n = 121) strongly agreed they used mailing lists for support, and 37% (n = 109) strongly agreed that they were on the mailing lists to help others. Smaller proportions of new subscribers strongly agreed that others on the mailing lists had similar cancer experiences (n = 23, 9%), that they could relate to the experiences of others on the lists (n = 66, 27%), and that others on the list gave them good ideas about how to cope with cancer (n = 66, 27%). Conclusions: Cancer-related online mailing lists appear to be an important resource, especially for information seeking but also for support of cancer survivors. These were the primary motivators most members reported for joining mailing lists. 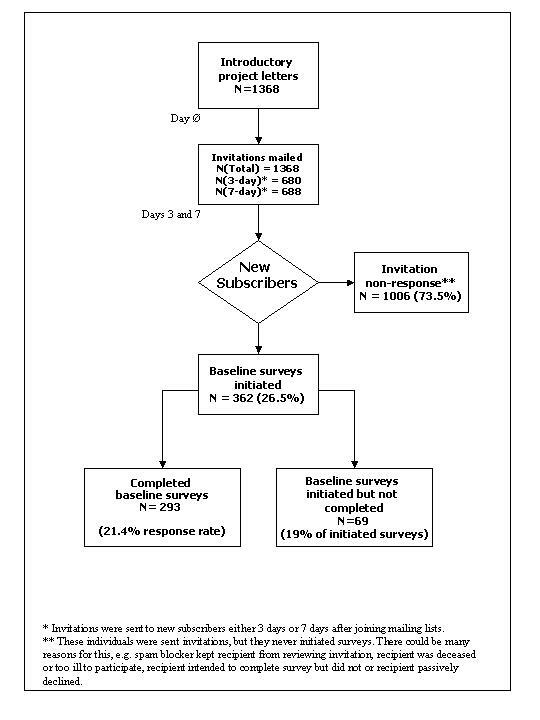 The modest proportion of subscribers who strongly agreed that they could relate to others' cancer experiences (as well as similar responses to other process questions) is undoubtedly due at least in part to the short duration that these subscribers were involved with the mailing lists. Emerging data, including our own, suggest that mailing lists are perhaps under-used by minority patients/survivors. These preliminary data add to a growing body of research on health-related online communities, of which online mailing lists are one variant. Recent data indicate that 65% of men and 61% of women in the United States go online ; the average American spends over 11 hours online each week . Moreover, it is estimated that 56.3 million people in the United States actively seek online information about chronic diseases , and 74% of all US adults who use the Internet report that they had looked for health information online in 2004 . By 2005, it is estimated that approximately 88.5 million adults will use the Internet to seek online health information (eHealth) . Although some researchers have questioned the precision of these estimates, it is clear that millions of people use the Internet for health information and that the Internet is an increasingly important health information source [6-8]. By 2001, there were approximately 9.8 million cancer survivors in the United States . Since survivors are defined as anyone living with or surviving cancer, this is a large population of potential eHealth users. Understanding how they seek and use online resources is important if we are to assure that they have the information they need, when they need it, and in a form and manner appropriate to their needs. These are communication goals of the National Cancer Institute (NCI) . The purposes of this paper are as follows: (1) to present background information about online mailing lists and electronic support groups (ESGs), (2) to describe the rationale and methodology for the Health eCommunities (HeC) study, and (3) to present preliminary baseline data on new subscribers to cancer-related mailing lists who chose to respond to an online survey. In particular, we describe subscribers' use of mailing lists, their reasons for using them, and their reactions to participating shortly after joining. The rise in Internet use has led to an increased number of people who seek support and information online. Some sources estimate that as many as 90 million Americans have participated in online support groups and that 1 in 4 people seeking disease information join online discussion groups . Reportedly, 23 million Americans are very active in online communities . A recent count found over 25000 health-related online self-help groups at one portal alone . While the estimates vary greatly, whatever the correct number, millions of people in the United States turn to online support groups to deal with their health concerns. Electronic support groups (ESGs), which include mailing lists, are much like self-help groups in that they are composed of members who share a common condition, situation, heritage, symptom, or experience . They are self-governing, usually, with clear rules about acceptable behavior. ESGs range from highly structured therapeutic groups to moderated and unmoderated chat rooms and mailing lists. ESGs and mailing lists share the common goal of helping people learn about and cope with a variety of risk factors, diseases, and conditions. Some ESGs are closed groups with substantial professional moderation, such as those reported by Winzelberg et al  and Lieberman et al . However, most of these moderated groups have been implemented as part of research projects. It is not clear whether such structures are viable as ongoing services that can be sustained over time. Currently, most ESGs appear to be unmoderated and are more like self-help or mutual help groups than face-to-face support groups . The mailing lists we are studying are characterized by wide reach and minimal intervention by most listowners who manage them. These lists are not moderated by health professionals although many of the listowners are extremely knowledgeable about health and cancer, and they intervene online and offline to correct misconceptions, enforce group norms, and provide information. Patterson et al  identified three types of beneficial health outcomes for computer health care services: (1) education of people, (2) provision of social support or assistance in obtaining social support, and (3) change in health behaviors. Online support groups, including mailing lists, may provide both instrumental and social support [17-20]. Cancer patients use mailing lists and other Internet resources for many reasons. These include seeking and obtaining information and support, seeking second opinions, and getting information needed to interpret information from health providers . In the process, the experience also may improve patients' self-esteem by putting them on a more comfortable basis with their health professionals. For patients with rare cancers, online groups may be the only way to get sufficient numbers of people together to form support groups . By sharing practical advice with one another, users may gain the wisdom that experience brings . ESGs may offer privacy and convenience, and people who do not feel well can participate from home. Moreover, people can communicate on the basis of shared experiences and concerns, not shared social characteristics (such as age, race, or gender) . Internet-mediated support may be especially important for people who are geographically isolated and those with rarer cancers  and may be particularly valuable for minorities and people in rural areas because of documented disparities in their access to health care and health information . Neuhauser and Kreps  cited other advantages of ESGs: the potential to be more interactive, participatory, and persuasive and to provide customized and contextualized information. Mailing list participation may have more reach and therefore greater population impact than in-person groups . However, while there are a growing number of reports about patients' experiences with health-related mailing lists, to date, we are aware of no published outcome studies in this area. Participation in ESGs may help patients be more involved in their care, find information, obtain support, and formulate questions to ask health providers . Like other self-help groups, ESGs provide experiential knowledge and peer support . Documented benefits of Internet applications range from decreases in pain and inappropriate health care use to improved quality of life . Decreased anxiety and/or depression have resulted from both online therapy [31,32] and participation in ESGs for women with breast cancer . Lieberman  also found positive increases in two subscales of the Posttraumatic Growth Inventory. Lorig et al  randomized arthritis patients to treatment consisting of a closed, moderated email discussion group plus book plus videotape or a control group. The treatment group had significant improvements in pain, disability, role function, and health distress and made fewer physician visits than the control group. Access to health information through ESGs may serve an especially important communication function (eg, enhancing confidence in asking questions of one's physicians) . Women with breast cancer who participated in the Computer Health Enhancement Support System (CHESS) were more competent seeking information, more comfortable participating in their care, and had greater confidence in their doctors. At five months follow-up, the group reported greater social support and information competence compared to nonusers of CHESS [36,37]. Online support groups have many of the same potential disadvantages as other forms of Internet communication, such as email. For example, there may be more hostile messages or “flaming” than would occur outside the Internet , and statements may be misinterpreted, causing discomfort and anxiety . Offers of instrumental help are infrequent, and if people develop friendships, those relationships usually exist outside the mailing list where perhaps more instrumental social support can be provided . Long-term relationships between individuals may be unusual . There is still debate about whether computer use and, by extension, mailing lists/ESGs, promote social isolation, for example, by providing a more accessible but less sufficient substitute for meaningful social support . Not surprisingly, mailing list postings include both information and misinformation. It is not known how these factors affect participants. In addition, some advice may encourage some people to adopt unconventional therapies . As Lamberg  noted, finding the right ESG may take some work, and quality may vary even more than in community support groups. In the current milieu, selected messages may be blocked to protect against spam, potentially isolating some users. The Science Panel on Interactive Communication and Health , while generally positive about the Internet, noted that there are some potential risks of using the Internet to obtain health information, including that patients could turn to inappropriate complementary and alternative treatments or that they could lose faith in their physicians. To date, there is little evidence of such effects . Evaluations of Internet-based services should include both potential benefits and limitations. It is essential to understand both the strengths and limitations of mailing list participation. Overall, Lieberman and Russo , based on a qualitative review of the literature, concluded that the impact of ESGs appears positive. Moreover, this seems to be a consequence of the qualities they share with in-person support groups (eg, people communicate with high levels of support, acceptance, positive feelings, normalization, and the perception of finding others like themselves and receiving meaningful information and support). Yet, as Eysenbach et al  concluded recently, based on a systematic review of all longitudinal studies, including cohort studies, before-after designs, and randomized trials, “No robust evidence exists for consumer-led peer to peer communities, partly because most peer to peer communities have been evaluated only in conjunction with more complex interventions or involvement with health professionals. Given the abundance of un-moderated peer to peer groups on the Internet, research is required to evaluate under which conditions and for whom electronic support groups are effective and how effectiveness in delivering social support electronically can be maximized” . Today, therefore, the evidence is scant [13,23]. Why do new mailing list subscribers join cancer-related mailing lists? What are new subscribers' expectations regarding mailing lists? How frequently do new mailing list subscribers use the mailing lists? How do they assess the lists shortly after joining, in terms of the similarity of their experiences to those of others and on several aspects of information seeking and social support? The preliminary baseline data reported here were collected as part of a larger impact evaluation. Understanding why people join these mailing lists and how they use them will enhance what is known about online health support. Our approach to understanding cancer survivors' use of cancer-related mailing lists is informed by theories on stress and coping [44-46] that emphasize primary appraisals of susceptibility to threats and perceptions of the severity of threats. Coping is the process of managing internal and external demands that are appraised as exceeding individual resources . Lazarus and Folkman  identified two broad categories of coping strategies—problem focused and emotion focused. Either can lead to positive or negative outcomes. In problem-focused coping, also referred to as problem management, a person takes constructive action to deal with threats. This might include joining a cancer-related mailing list. In emotion-focused coping, also referred to as emotional regulation, a person acts to control emotional responses to a threat. This may include seeking social support, venting feelings, or practicing avoidance and denial. Heightened perceptions of risk can cause distress, disengagement, and avoidance behaviors [44,45] but may also motivate problem management coping in the form of seeking information and social support. Current models of the processes by which people confront stress propose that a number of variables, such as personality characteristics, external resources, and social support, can influence coping, thereby mediating the effect of coping on psychological outcomes . In particular, social support can facilitate an individual's positive efforts to cope, and it has the potential to bolster both positive problem-focused and emotion-focused coping. Further, the absence of a social support network has been tied to a more rapid course of illness (although these data should be received as preliminary) and to more depression . Thus, seeking social support through mailing list participation may be a useful strategy that ultimately can improve a person's quality of life and health behaviors. Whether those factors can improve health outcomes remains to be seen. We are using a longitudinal cohort design to assess the impact of ACOR mailing lists on selected outcomes for new subscribers; however, we only report cross-sectional baseline data in this preliminary paper. For the pilot study, new members were recruited to participate about a week after they subscribed to one of 10 ACOR mailing lists. (However, some subscribers may have waited several days to respond or may never have responded.) Invitations to participate were sent to new ACOR members via email. Willing participants could either follow hyperlinks to Web-based surveys or request that they be interviewed via telephone. As less than 1% of respondents requested telephone interviews, we will not discuss telephone interviews further in this paper. Up to three post-notification contacts were made to each non-respondent by email to increase responses [51,52]. All survey instruments and materials were reviewed by The University of North Carolina Institutional Review Board. Sociodemographic and medical variables. We collected data on variables such as age, race, ethnicity, education, marital status, health insurance, and type of cancer. Because of sample size limitations, we did not examine differences among respondents according to these categories. Information seeking. Information seeking items were drawn from the National Cancer Institute's Health Information National Trends Study (HINTS) . Mailing list use processes. Adapting questions used by King , we collected information on the number of times subscribers read mailing list messages, the average number of minutes they spent reading/posting messages, how often they posted messages, and how often they contacted mailing list members outside of mailing list postings. Throughout the pilot phase, we collected data on survey usage patterns through time stamps. The online survey took a “stamp” of the time when respondents continued to another page of the survey, saved their progress, and completed the survey. See Table 1 for an example of time stamps for three respondents. These data were invaluable in revising surveys. During a pilot test, we cut over 1.5 minutes from the average survey completion time by adjusting pages that were particularly time consuming and demanding. We also reviewed where break-offs occurred and rearranged questions to maintain respondents' interest. When we saw that break-offs were clustered around a particular group of questions, we changed the order and broke those questions up into separate pages. Subsequently, break-offs became random and fewer, suggesting that time-stamp data permitted us to gain valuable insights into the way users were responding to surveys. The average time to complete the survey was 21.5 minutes. Data from incomplete surveys were excluded from the data reported here. * One respondent completed the survey in 12:24 minutes, and two respondents broke off (one at less than 1 minute and one at 2:51 minutes). Cumulative email invitations were sent to 1368 new mailing list subscribers; 293 Web surveys were completed (21.4% response rate). Figure 2 shows the flow from initial emails to survey distribution. Ideally, the response rate should be corrected for undeliverable email addresses and ineligibles. This is extremely challenging, much more so than for traditional survey methodologies, such as mailed surveys in which undeliverable letters can be obtained through the post office. It also is more difficult than for telephone surveys, in which ineligible numbers can be identified. When email invitations are sent, many will not be delivered for a variety of reasons, such as powerful spam blockers, changed email addresses, people who no longer use the mailing list but have not officially unsubscribed, and people who died or are now too ill to participate. Because people often turn to the lists when they are initially diagnosed or are suffering recurrences, subscribers may be preoccupied with doctors' visits and may have little discretionary time for other activities. Unfortunately, we cannot identify these sources of nonresponse. As Table 2 shows, most new mailing list subscribers were aged 50 or older (72%) and had insurance coverage (97%). Subscribers were nearly evenly divided between men and women. Most were married (80%), had no young children living in the household (79%), were white (98%), and had at least some college education (86%). The majority described their health as good or very good despite having had a cancer diagnosis. Most respondents were diagnosed with cancer in their 50s and reported being in treatment. * Percentages may not add to 100% due to rounding. We asked why respondents used the Internet over the past 30 days (Table 3). New members indicated that they often used the Internet to find out more about cancer (61%), to find information on general health issues (26%), and to communicate with others with the same condition (21%). In the last 30 days, 17% often used the Internet to find information on prescription drugs, and 12% often used the Internet to find information on health-related products such as herbal remedies and vitamins. Only 7% said they often used the Internet to communicate with doctors or other health professionals. * Rows may not add to 100% due to rounding. New mailing list members said they used ACOR mailing lists for a variety of purposes (Table 4), including information and support. For example, respondents strongly agreed that they were participating in the mailing lists to find out about the latest cancer treatments (64%), to get information about how to deal with cancer (62%), to find out how to deal with side effects (53%), to get information about treatment options (53%), to see how other patients with the same cancer were doing (48%), and for support (42%). Even among these new subscribers, 37% strongly agreed they were on the mailing lists to help others. Less important reasons, but still strongly endorsed by one-third or more of respondents, were to get ideas about how to talk with doctors, to get help with decision making, and to reduce uncertainty. We asked these new subscribers to specific ACOR mailing lists how they used the mailing lists in the past seven days since they had subscribed. This information was intended to serve as the baseline for subsequent comparison: 78% said they checked their email for messages four or more times in the last seven days; 41% of new subscribers reported spending 1 to 3 hours per day reading and responding to mailing list messages; and 30% said they exchanged private emails with 1 to 3 subscribers (Table 5). Only small proportions of respondents reported private emails or phone calls with group members. We also assessed reactions to group processes that took place on the mailing lists. Of new ACOR subscribers, 9% strongly agreed (62% agreed) that others on the list had similar experiences, 31% strongly agreed that they could express their opinions on the mailing lists, 27% strongly agreed that they could relate to other members' cancer experiences and that others on the mailing list gave them good ideas about how to cope with cancer, and 12% strongly agreed that they could disagree with other members' statements (Table 6). We asked how much help new members received from being on the mailing lists (Table 7): 39% indicated that other members gave them quite a bit/very much help, while only 7% said they gave quite a bit/very much help to other members. Fifty percent of new subscribers said listowners provided quite a bit/very much information that members needed, and 43% said that listowners helped with discussion quite a bit/very much. * Number may vary slightly due to skip patterns. 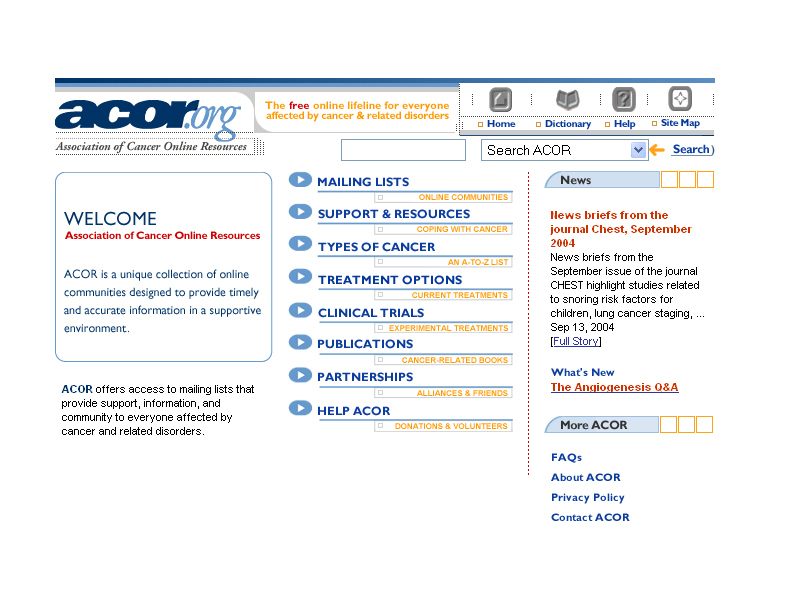 The picture that emerges from Web surveys completed by cancer survivors who were new subscribers and received invitations to participate within about a week after subscribing to ACOR mailing lists is one of people who turned to the mailing lists for information and support, especially information. They particularly were looking for information about treatment, coping with side effects, and treatment options, with half or more of new subscribers providing these as reasons for joining mailing lists. Over 40% also cited support as one of the reasons they joined the lists. Although only 37% of respondents noted helping others as one of the reasons they joined the list, it is striking that even this proportion of people saw helping others as a reason for joining mailing lists. It is possible that helping others and receiving support become more important over time as the lists become more useful and central to subscribers when their tenure on it increases. Reading and responding to messages accounted for one to two hours a day, on average, for survey respondents. Follow-up survey data will help to put these numbers in context. We cannot predict whether the amount of time will increase, decrease, or stay the same. Also, we do not know the accuracy with which people report time spent online. In view of their newness to the lists, it would be expected that many new subscribers would watch and wait, perhaps even lurk, before playing an active role. Moreover, we would expect some of their assessments and perceptions to change over time. Several days into their use of a mailing list, many subscribers would not have observed conflicts or even be aware of listowners' actions to facilitate improved group processes. In fact, many of these interventions occur behind the scenes. Since this is a longitudinal study, we will be able to assess changes in participation patterns one and four months later as participants become more comfortable and perhaps more active on the mailing lists. Our larger study will also assess whether there are changes over time in subscribers' assessments of mailing list processes. We expect that the amount of help subscribers perceive themselves having received and given will be a function of many factors, including their illness trajectory, type of cancer, other support and information available to them, and the lists to which they subscribe. Although our full study will examine changes over time in subscribers' use of mailing lists and other outcomes of interest, here we focused only on the preliminary baseline survey, which would have the same strengths and weaknesses as similar cross-sectional surveys. For example, we can only report what subscribers said and cannot infer causal relationships. It is unfortunate that so few minorities completed surveys. We do not know if that is a reflection of a small number of minorities using mailing lists, their lesser inclination to complete this survey, or both. Recent data indicate that 46% of African American adults are online versus 64% of white and 63% of Hispanic Americans . Thus, blacks still are using the Internet at a lower rate than whites but at a higher rate than our data would suggest. Fogel et al  found lower use of Internet listserv and self-help groups by minority breast cancer patients. McTavish et al  analyzed differences between black and white women who used online support. Black women were more likely to be lurkers, spent less time online, and wrote more messages about breast cancer and fewer messages about everyday life than white women. Klemm et al  reported that, in 10 studies they reviewed, most users of online support were white. Only 14% of the respondents in Schmidt and Andrykowski's study of Internet support for breast cancer were African American . However, the authors showed that Internet use for breast cancer information was associated with greater social support, and minorities showed greater gains than whites as a result of exposure to the intervention. Gustafson et al  and Shaw et al  similarly demonstrated that minority women with breast cancer benefit from use of the Internet. If, as Lieberman and Russo  concluded, ESGs are similar to face-to-face self-help groups in their beneficial impact, it may be appropriate to develop more proactive strategies to encourage diverse cancer survivors to use mailing lists and other ESGs. More research is needed to understand the many issues involved in asking patients to complete Web surveys, from assessing the physical, psychological, and cognitive demands of different question formats to examining ways to estimate true response rates. Online and other survey methods are substantially different. The lessons of one method cannot be transferred to others without more research . Our conservatively calculated response rate of 21.4% is less than one would expect based on other survey formats. However, as Kraut et al  and others noted, online surveys yield lower response rates than other survey methods. A recent report from RAND showed wide variation in response to Web-based surveys . For example, Fogel et al  reported a 9% response rate of cancer patients to their online survey. Our results appear to be within the range of what has been reported for other online surveys of cancer patients. However, it is striking how few Internet-based survey reports contain response rates. It is likely that a substantial component of non-response may occur because of constraints inherent in online research, such as powerful spam blockers and changing email addresses. Finally, although there is much that is challenging about Internet research, especially when conducted among cancer survivors, the Internet also offers tools not available in other modes. For example, we found time-stamp data extremely valuable in overcoming break-offs by permitting us to pinpoint areas in the survey that respondents had trouble answering. Moreover, the potential to include people from around the world is an attractive aspect of Web surveys. While our data do not yet answer Eysenbach's questions about the impact of online communities , the data do begin to paint a more complete picture of why cancer patients turn to the Internet, how they use mailing lists, and how they rate the processes of using the lists. As comments from subscribers show, this is a powerful world that is compelling and, potentially, not only supportive and informative but perhaps, sometimes, lifesaving as well. Creative research strategies will be needed to assess the many important questions related to use of online support by cancer patients and others. Among the intriguing questions are whether and how online support differs from in-person support and whether some people are more likely to benefit from one modality over another. This research was funded by a Robert Wood Johnson Foundation (RWJF) Health e-Technologies Initiative grant. This manuscript was supported by grant # 49152. This report does not represent the views of the RWJF. The authors would like to thank Gilles Frydman, President of ACOR, Charles Rawls, Chief Technical Officer of ACOR, and the members of the online survey programming team: Edward Maas, Ilya Zherebetskiy, Anthony Volodkin, Raj Goel, Bridget Rawls, Alanna Rawls, and Jack Brooks. This research could not have been done without ACOR's role in identifying lists and listowners, sending invitations to subscribers, tracking survey data, programming the survey, and communicating with listowners. A number of ACOR listowners have been important partners. We are grateful to Tara Strigo, MPH, and Rachel Mandal, MSc, at UNC for their roles in managing the survey, as well as Bernard Glassman, MA, 3AM Communications. In addition, we thank Dr. Neeraj Arora, National Cancer Institute, and Dr. Lari Wenzel, University of California at Irvine, for their contributions to survey development and Martha Songayllo for graphics help. Finally, we are grateful to all the ACOR mailing list subscribers who completed surveys. Horrigan JB, Rainie L. Getting serious online. Washington, DC: Pew Internet & American Life Project; 2002. Meier A. Technology-mediated group work. In: Garvin CD, Galinsky MJ, Gutierrez LM, editors. Handbook of Social Work with Groups. New York: Guilford Publications; 2004:477-493. Patterson TL, Shaw WS, Masys DR. Improving health through computer self-help programs: theory and practice. In: Brennan PF, Schneider SF, Tornquist E, editors. Information Networks for Community Health. New York: Springer; 1997:219-246. Taenzer P, Zendel I, Birdsell JM, McGregor SE, Freiwald S. Cancer, me?? : health care advice goes online. In: Brennan PF, Schneider SF, Tornquist E, editors. Information Networks for cCommunity Health. New York: Springer; 1997:205-218.
; Robert Wood Johnson Foundation. Impact of Health on Health Behavior Change: Empirical Literature Review. West Kingston, RI: Pro-Change Behavior Systems; 2001. Gustafson DH, Julesberg KE, Stengle WA, McTavish FM, Hawkins RP. Assessing costs and outcomes of providing computer support to underserved women with breast cancer. Electronic Journal of Communication 2001;11(3-4). Finn J, Lavitt M. Computer-based self-help groups for sexual abuse survivors. Soc Work Groups 1994;17(1/2):21-46.
; Science Panel on Interactive Communication and Health. Wired for Health and Well-Being: The Emergence of Interactive Health Communication (017-001-00541-0). Washington, DC: US Government Printing Office; 1999. Wenzel L, Glanz K, Lerman C. Stress, coping and health behavior. In: Glanz K, Rimer BK, Lewis FM, editors. Health Behavior and Health Education. San Francisco: Jossey-Bass; 2003:210-239. Lazarus RS, Folkman S. Stress, Appraisal, and Coping. New York: Springer Publishing Company; Nov 1, 1984. Sheehan KB, Hoy MG. E-mail surveys: response patterns, process and potential. In: Proceedings of the 1997 Conference of the American Academy of Advertisers 1997. King SA. Researching Internet communities: proposed ethical guidelines for the reporting of results. The Information Society 1996;12(2):119-128. © Barbara K Rimer, Elizabeth J Lyons, Kurt M Ribisl, J Michael Bowling, Carol E Golin, Michael J Forlenza, Andrea Meier. Originally published in the Journal of Medical Internet Research (http://www.jmir.org), 1.7.2005. Except where otherwise noted, articles published in the Journal of Medical Internet Research are distributed under the terms of the Creative Commons Attribution License (http://www.creativecommons.org/licenses/by/2.0/), which permits unrestricted use, distribution, and reproduction in any medium, provided the original work is properly cited, including full bibliographic	details and the URL (see "please cite as" above), and this statement is included.